Notes: Checklist incomplete. 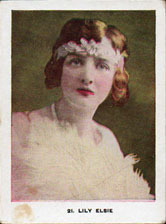 There are two sets of Westminster Stage and Cinema Stars, one with the text for the caption in gray ink, the other in black ink. This checklist is for the set with the black captions.